/BigMIND /Policies /How can I control the permissions that my users have? If you have assigned a policy to your users, you can control the permissions they have by using the options under the Privileges tab in the policy. Enable delete data: Enabling this option will give your users the ability to delete unwanted files from their backup. Enable sharing: If you have Instant Storage (Hot Storage), your users will be able to share the files uploaded to their accounts with any person (whether he is Zoolz/BigMIND user or not) by using the sharing options in the web. Allow the ability to edit sign in email: This option will give the user the ability to change the email he/she uses to sign into their Zoolz/BigMIND account. Allow the ability to change password: By enabling this option, your users will be able to change their passwords from the web when needed. 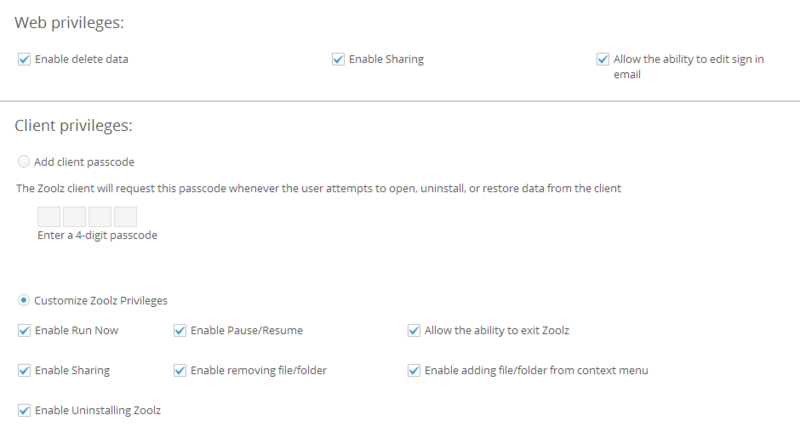 Allow the ability to edit username: This option will give the users the ability to change their Zoolz account’s username. Add client passcode: By enabling this option, the Zoolz/BigMIND desktop client will request this passcode whenever the user attempts to open, uninstall, or restore data using it. Enable Run Now: This option will allow the user to force the backup to run at anytime by hitting the Run Now button on the client’s dashboard. Enable Pause/Resume: This option will allow the user to pause/resume the backup by hitting the Pause/Resume button on the client’s dashboard. Allow the ability to exit: By enabling this option, the user will be able to end Zoolz/BigMIND process and therefore the backup will stop and will not start again until the user starts Zoolz/BigMIND again. Enable Sharing:If you have Instant Storage (Hot Storage), your users will be able to share the files uploaded to their accounts with any person (whether he is Zoolz user or not) by using the sharing options in the context menu. Enable removing file/folder: This option allow users to exclude any file\folder from the backup using this option is the context menu. Enable adding file/folder from context menu: This option will allow the users to add new files\folders to the backup using this option in the context menu. Enable Uninstalling: By enabling this option, the user will be able to uninstall Zoolz/BigMIND software from his/her machine at anytime and thus stops the backup.